Popular with Londoners and visitors the world over, it's also the perfect place spot to enjoy the views with a drink in hand. Come home to music at Spiritland, a music lover's paradise at the foot of Royal Festival Hall. Its long terrazzo marble bar is a great meeting place for drinks any day of the week, with an inventive cocktail menu boasting the classics with a twist, plus a 110-strong list of wines from some of the world's very best winemakers. What's more, Spiritland has one of the latest licenses on the South Bank, running most nights until 2am, with guest selectors playing the cream of their record collections on a custom-built, world-class sound system Thursday–Saturdays in addition to weekend DJ brunches. New tastes and unexpected combinations await at Dandelyan at the Mondrian hotel, created by multi-award-winning bartender Ryan Chetiyawardana A.K.A Mr. Lyan. Serving both innovative cocktails and refined interpretations of the classics, Dandelyan takes its inspiration from the botanical wilds of the British countryside and around the world. Prepare to lose yourself in the exotic flavours on offer... And as if the cocktails weren’t enough, their iconic green marble bar is sure to provide a talking point. The latest cocktail menu is called The Modern Life of Plants and describes itself as the second volume in the Dandelyan story, exploring "the science and art at play in the human adaptation of plant and animal life, which pushes plants and plant life beyond their normal ‘natural’ biological terms'. With spectacular views of Waterloo Bridge and the River Thames, the vibrant BFI Riverfront Restaurant & Bar is the hottest spot on the Southbank. Offering an Italian menu ideal for sharing, from homemade pizzettas and pasta to gelato from our Gelato Bar. OXO Tower Bar is the perfect spot for after-work cocktails - the view is simply breath-taking and it is one of London's most iconic buildings. Enjoy your drinks at the Bar terrace, which is often decorated dependent on seasonal themes or to promote new drinks offers - we loved their recent Portuguese themed terrace to celebrate Graham's Port. But OXO isn't just a great place for cocktails. OXO has also created its own session IPA, brewed in Hackney, working with the ‘brew crew’ at CRATE Brewery. It's refreshingly light and completely unique India pale ale, preferably paired with a pork scratching or two. Add a little bit of luxury to your evening drinks. Skylon oozes chic sophistication and boasts stunning views across the river Thames – perfect for date night. They are also well known for their stand- out cocktails, mixed with a unique flair and imagination. Until the 30 November, Skylon are hosting a "Gin Lover's Experience" - a masterclass led by Skylon’s experienced mixologist. Start with a tasting of 3 gins from Skylon's extensive collection, each paired with the appropriate tonic. Hear all about the history and heritage of gin as well as the nuances and delicacy of tonics and how to enhance flavour with homemade tonics. After learning and sampling a selection of gins at the bar, savour a 3-course lunch from a set menu at the Grill (£50 per person, available Monday to Friday – 12.00 to 4 pm only). Did you know that Gillray’s at the London Marriott hotel at County Hall has over 100 different gins to sample? Their enigmatically named iconic drinks such as Two Penny Whist, Regardez Moi, Uncorking Old Sherry and Fashionable Contrast make for a deliciously difficult to choose from menu, and what’s more, the bar is now open until 10:30 pm. Gillray’s winning combination of a unique view (a panorama of Big Ben and the House of Parliament, just so you know) with the latest trends in mixology to create one-of-a-kind cocktails make it one of South Bank’s top secret bars. Step behind a bookcase at BFI Southbank and you'll find yourself in the secret bar known as the Drawing Room - and slip into a different era. This intimate, 1920’s jazz-infused speakeasy-style bar can host your pre-dinner aperitifs and late-night cocktails. Need a bar all to yourself and your very own bartender to attend your every whim? You can book the Drawing Room out for your private function. Boasting exotic cocktails and live music, Primo Bar at Park Plaza Westminster Bridge is always alive with evening activity. They've got live music every night, focusing on acoustic international music, whilst also bringing up-and-coming talent into the spotlight. Featuring an exciting monthly programme, the musical selection promises to complement an evening of great company, cocktails and new memories. There's also 2 for 1 cocktails every weeknight between 5 pm and 8 pm, Primo is primed to party. (Jaw-dropping views are an added extra). Sea Containers London’s 12th Knot comes alive as the sun goes down. Inspired by one of the most extraordinary cults of youth and frivolity in history, the Bright Young Things, they specialise in bubbly - serving an extensive list of the world’s best champagne offerings, by the glass, bottle, or in speciality cocktails by resident mixology master Mr Lyan. A magical glittering glass box perched atop Sea Containers London. A relaxed and friendly craft beer pub at the National Theatre. 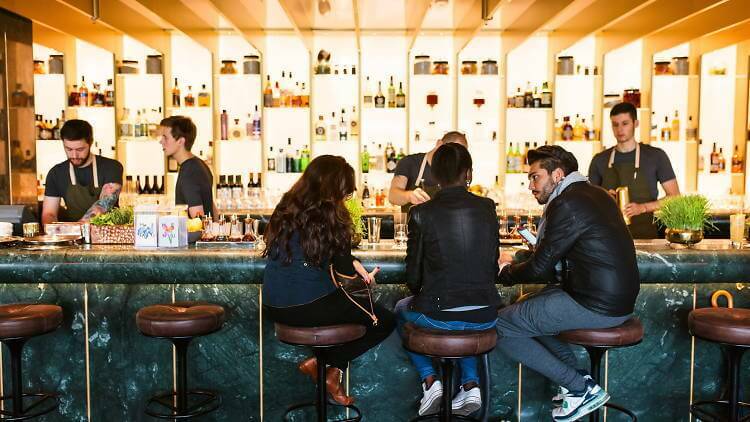 Situated right on London's vibrant South Bank, The Understudy has riverside seating and serves a range of draught beers, wines and cocktails – the laid-back vibe makes it the perfect meeting spot for after work drinks with friends. Love Sunday afternoon in the pub? Love board games? Head to the understudy for Board Stupid Sunday - where every winner will get a free drink! The perfect place to escape the busy hubbub of the street during the day or to grab a drink or delicious bite to eat pre/post performance. This newly refurbished, relaxed all-day café and late night bar serves local food, proper coffee (including speciality coffee from Workshop Coffee, Clerkenwell) and great wines. Unpretentious and stylish, Penny is a must visit. For something a little more homely, try Studio 6. Based in the oasis-like conclave of Gabriel’s Wharf, Studio 6 serve affordable and tasty tipples from a surprisingly extensive menu. Whether you choose to sit inside and watch the world go by in winter or enjoy the dappled sunshine on their terrace in the summer, Studio 6 is always alive with activity. Now we've got the 24-hour tube, Mark’s Bar at The Old Vic, which is open until 2am Thursday to Saturday, is the ideal place for late-night drinking in Waterloo. With a cocktail list of historical curiosities and celebrations, you can sit back and enjoy a more eccentric approach to drinking. There is also a selection of craft beers and wines by the glass to choose from. Located at the Dress Circle and Upper Circle bars, expect an eclectic design with an illustration by Chris Martin, and artwork by Oliver Durcan, Charming Baker, Jimmy C, wallpaper designed by Mat Collishaw, the famous Mark’s neon by Tim Nobel and Sue Webster and details such as smoky mirrors, ambient lighting, an assortment of furniture sourced by Mark and apothecary cocktail bar. Mark’s Bar is open to The Old Vic ticket holders from 6 pm and then to the public after the evening’s performance (consult The Old Vic website for details). Customers attending the show are invited to pre-order cocktails for the interval from the shortened cocktail menu. A floating bar on the River - City Cruises offer the best views of London, right from the river Thames with its fabulous evening cruises. Sail off into the evening while the rest of the world goes by. As you step on board, you're given a welcome glass of fizz, whilst you enjoy some live music before setting off onto the river. On City Cruises boats, there's space to unwind, have a leisurely stroll and tuck into some tasty nibbles. The onboard bar has a wide selection of drinks (soft and otherwise), including more bubbles, Pimms, G&T and more. Evening cruise tickets include sparkling wine or soft drink on arrival, a selection of cold canapés served throughout the evening, live music and a 2 hour River Cruise. To celebrate London Cocktail Week, journey through time and flavour at the Schweppes Flavour Adventure on the London Eye, from 3 – 7 October. Accompanied fast-track entry onto The London Eye. The London Eye rotation lasts approximately 30 minutes. For more information on the Schweppes Flavour Adventure, click here. Did you know that Witness for the Prosecution, the play by Agatha Christie set inside the historic County Hall building in South Bank, also has a very atmospheric bar, serving a fantastic "Juror" cocktail? Sip it in the historic, wood panelled chamber of London’s County Hall, before you enter the "courtroom" and watch the award-winning performance. Chino Latino is a multi-award winning modern Pan-Asian cuisine restaurant with a Latin cocktail bar, located right at the top of Park Plaza London Riverbank. The views are absolutely stunning, and the bar team craft unique Latino-inspired cocktails. We recommend heading there on a Thursday, for their Sundowner Nights - take in the views and riverside sunsets with live music, rum cocktails & plenty of dim sum.